Municipal (city) court processes violations of city ordinances committed within city limits. In many cases, these ordinances involve traffic, shoplifting, and offenses such as dog leash law violations, and disturbances. Individuals have the right to a jury trial in the Municipal Court, in some cases, and can appeal a decision to a state court. The Fort Collins Municipal Court is located at the Fort Collins city building at 215 North Mason. The other city municipal courts are located within their respective city buildings. Every county in Colorado has a county court with one or more county judges. These courts handle traffic cases and misdemeanor criminal matters, as well as small civil actions to $15,000 (amount as of 2001). In certain cases, citizens can have a jury trial if they choose. An appeal from a county court decision may be made to the district court. County Court is located in the Larimer County Justice Center and in Loveland at 810 East 10th Street, Loveland, CO 80537. The Small Claims Court is a division of the County Court. Individuals are allowed to argue their own cases and to have speedy decisions on civil matters involving no more than $7,500 (amount as of 2001). There are no jury trials and matters are heard by a magistrate. Small Claims Court is located in the Larimer County Justice Center. The State of Colorado is divided into 22 judicial districts with one or more district judges in each district. Larimer County is included in the Eighth Judicial District and has seven district judges and four magistrates. These courts have the authority to handle many types of cases including divorces, civil claims, juvenile matters, probate (estates), mental health and criminal cases. Any individual may appeal a district court decision to the Colorado Court of Appeals. District courts are located in the Larimer County Justice Center. The Probation Department provides an alternative form of sentencing for someone convicted of a crime. Appropriate persons may be placed under the supervision of a probation officer, rather than going to jail or prison. The probation department is located in the Larimer County Justice Center and on the sixth floor at 3l5 West Oak Street in Fort Collins, and in the Loveland Police and Courts building at 810 East 10th Street and also at 205 East 6th Street in Loveland. Community Corrections provides positive local options for adult and juvenile non-violent offenders. Adult services include a 63 bed residential facility, non-residential supervision, sentencing evaluations, and pretrial bond supervision. Youth services include juvenile jail screening, community service programming, and victim offender mediation. The Public Defender is a lawyer employed by the State government to represent a person accused of a crime who cannot afford to hire a private lawyer. The Public Defender does not represent people in any civil matters. The Public Defender's Office is located at #1 Old Town Square, Suite 200, in Fort Collins. The County Attorney's Office provides legal service and advice to the Board of County Commissioners and their divisions and departments, and, when appropriate, initiates and represents the county in litigation. The County Attorney's office also handles involuntary commitments to the state hospital. The County Attorney's main office is located in the First Tower Building, 215 West Oak Street, on the ninth floor, Fort Collins. City attorneys advise city council and employees of the city in matters relating to their official powers and duties. They represent the city in all legal proceedings, as well as prosecute all violations of the city code and ordinances in municipal court. City attorneys may also issue advisory opinions regarding the interpretation of the city code and ordinances. They do not render private legal advice as to how the provisions of the code affect the legal rights and responsibilities of individual citizens. The City Attorney's Offices are located in the respective municipal buildings in Fort Collins, Loveland, Berthoud and Estes Park. 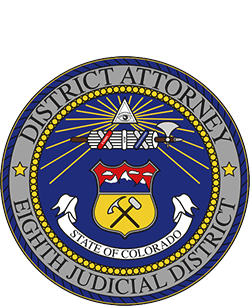 The District Attorney's Office represents the People of the State of Colorado by serving as the prosecuting attorney in criminal cases. The District Attorney's Office is not allowed to handle civil matters except for limited representation of county public officers. The District Attorney's Office cannot render private legal advice as to how the provisions of the state statutes affect the legal rights and responsibilities of individual citizens. This fund consists of money provided through fees levied against persons convicted of felonies, misdemeanors and certain traffic offenses. Persons victimized by crime in Larimer County can apply to the Victim Compensation Fund to have certain costs associated with the crime committed against them paid for. Compensable costs include medical, funeral, and counseling expenses as well as residential doors, locks and windows if they are damaged or destroyed during a crime. The Victim Compensation Fund is administered by a Board of Directors appointed by the District Attorney. A felony is a criminal offense which is punishable by a sentence up to and including the Colorado Department of Corrections. A misdemeanor is a criminal offense which is punishable by a sentence to a fine, probation supervision, the county jail, or a combination thereof. What is the difference between the District Court and the County Court? The District Court handles all criminal cases which include a felony charge and all criminal cases where the person charged is a juvenile under the age of 18 years of age. The County Court handles all criminal cases involving misdemeanors, traffic offenses and traffic infractions. You may call their office at (970) 493-1212 and press 0 to ask for assistance or you may go to their office at #1 Old Town Square, Suite 201, Fort Collins, CO 80524 and fill out an application. I missed my court date; what should I do? You should contact the Court as soon as possible to avoid the possibility of a warrant being issued for your arrest. If you have a bondsman, you should also contact them and advise them that you missed your court date. I am a defendant and I don't think my attorney is very good. Can I talk to the Deputy District Attorney assigned to my case? If you are represented by an attorney, the Deputy District Attorney cannot ethically talk with you about your case without your attorney being present. I received a subpoena from the District Attorney's Office. Who can I talk to about the subpoena? You should talk to our witness coordinator at (970) 498-7285. By statute, the District Attorney's Office is responsible to prosecute crimes which have been charged following an investigation by a law enforcement agency such as the police or sheriff's office. To report a crime, you should contact your local police or sheriff's office. This is a court appearance where the defendant, after being advised of his/her rights, makes a decision to either plead guilty and avoid a trial or plead not guilty and request a trial on the charges. A preliminary hearing is a hearing before a judge to determine if it is more probable than not that the defendant committed the felony offenses for which the defendant has been charged. If the judge finds the probable cause exists then the defendant is bound over for trial. If the judge does not find probable cause exists then the felony charges are dismissed. Colorado statutes authorize a person to plead guilty to a criminal offense but to postpone sentencing on that offense for a period of time not to exceed two years on a misdemeanor or four years on a felony. During this postponement period, the defendant must remain law abiding, pay restitution and court costs, and complete any conditions set by the court such as drug/alcohol treatment, domestic violence treatment, mental health treatment and useful public service work. At the end of the postponement period, if the defendant has fully complied with the conditions of his deferred sentence, the defendant can withdraw his guilty plea and the charge is dismissed. However, if the defendant fails to fully comply with the conditions of his deferred sentence, the Court will sentence the defendant upon his previously entered guilty plea. I want to voice a concern about how my case is being handled by the Deputy District Attorney assigned to my case. To whom can I speak? If you have a concern about how your case is proceeding, you may email our office. If you are represented by an attorney, we are prohibited from discussing your case with you. You will need to address these concerns with your attorney. There are four specialty courts in Larimer County --- Adult Court, Wellness Court, DUI Recovery Court and Juvenile Recovery Court. Each specialty court is an alternative to the regular criminal justice process for high risk offenders. The specialty courts focus on reducing recidivism through collaborative efforts with community service providers, thereby providing public safety with cost effective alternatives to incarceration. Contact the Larimer County Sheriff's Office at (970) 498-5100. How do I make a request to modify something with my case (protection order, court costs, useful public service hours, bond amount)? A Motion and Order with your request should be filed with the Court. I would like to get my property/evidence back, what is the procedure? If the case is still an active case and/or co-defendant's cases are still active, no property/evidence will be released until the case has concluded. If the case is closed, you will need to contact the law enforcement agency that investigated the case to set up an appointment to picky up your property/evidence. How do I seal my case? Whether or not you are eligible to have your case sealed depends on the type of case and on the resolution of your particular case. If you wish to research your eligibility to seal your case, you can consult the Colorado Revised Statutes 24-72-701 through 24-72-709. You may also wish to consult an attorney on this issue or contact the court's website and self-help center at 970-494-3500. I have to appear in court on a ticket. Can I talk to the DA before my court appearance? You will have an opportunity to talk to a Deputy District Attorney on your court date, after you have been advised of your rights by the Court. All 1A court appearances are mandatory. If you have hired an attorney, the Deputy District Attorney cannot speak with you about your case unless your attorney is present. I received a ticket and have been given 20 days to pay the fine. Can I talk with a DA first? A mail in ticket is call a "Penalty Assessment Ticket." Most penalty assessment tickets are for offenses classified as traffic infractions. By statute, the District Attorney is not the prosecuting attorney for traffic infractions and therefore you do not have the opportunity to talk to a DA about these tickets. If the 20 days have passed, you must appear at your court hearing and a Deputy District Attorney will be available to review your case at that time. I am under 18 and received a ticket to appear in court. Do I need to bring a parent? Yes. Colorado law requires any minor under the age of 18 to inform his or her parent or legal guardian of the ticket and the requirement to appear in Court. The parent or legal guardian is also required to appear in Court with their minor child. I received a photo radar ticket or red light ticket. What do I do? Photo radar and photo red lights tickets are handled by the Fort Collins Municipal Court and the Fort Collins City Attorney's Ofice. The Fort Collins Municipal court is located at 215 North Mason, Fort Collins, CO, and may be reached at (970) 221-6800. I live out of state or I live more than 100 miles from Larimer County. Do I have to come back to my court date, or do I have other options? All 1A court appearances are mandatory. You have the option of hiring an attorney to represent you at your court appearance; however, if a bench warrant has already been issued, you must post bond to receive a new court date. How can I get the police reports pertaining to my court case? Please see the Central Services & Discovery webpage for more information. Can someone else come to Court for me? They have my power of attorney. The only person who can appear on your behalf is an attorney who is licensed in the State of Colorado. Even if represented by an attorney, your appearance in court is usually required unless the Court has excused your personal appearance. There is a no contact order in my case and I want to lift it. What can I do? In order to request a no contact order be removed, you must fill out the appropriate paperwork with the Court. Filling out the motion to lift the no contact order does not guarantee that the Court will lift it. Contact the Courts at 970-494-3500 for more information. I need to change my court date. How do I do that? Only the Court can change your court date. You can contact the Clerk of the Courts at (970) 494-3500 or file a Motion to Continue with the Courts in letter format including your case name and number. The defendant has passed away. How do I take care of their case? Please contact our office and provide the defendant's name, date of birth, case number and the county where the defendant passed away. Please include your contact information. I cannot complete my sentence or I need to change the conditions of my sentence. How do I do that? If you had an attorney on your case, you should contact your attorney to assist you with a possible change of sentence. If you did not have an attorney, you may file a written motion with the Court requesting a modification to your sentence. I received a copy of a Motion to Revoke in the mail. What do I do now? Once a Motion has been filed with the Court, the Judge will determine whether or not to issue a warrant or a summons to appear in Court. You should receive a copy of the Court's Order in the mail. If you have questions about the Order, or have not received the Order yet, you should contact the Courts at (970) 494-3500. If you feel that you have completed all terms and conditions of your sentence, please bring proof to your next court date. I think someone used my name when they got their ticket. What can I do about it? Please contact your local law enforcement agency for assistance as directed by C.R.S. 16-5-103(3). I need to reinstate my license and there is a hold (outstanding judgment warrant) on my license. What can I do? If you case is Driving Under Suspension, Driving Under Restraint or Driving Without a Valid License, and you have an OJW for failure to appear on your court date, you may request an early release of the OJW from our office. All other cases that do not fit into the previous categories must wait for case closure before you can have the OJW released. OJW Release Form. How do I get an Affidavit for Deferred Sentence Review? The Affidavit and Deferred Sentence Form can be printed and filled out. The original should be filed with the Clerk of the Combined Courts and a copy sent to our office. You will find both addresses listed on the Affidavit. Can my child be charged with a crime without law enforcement notifying me first? Yes. If the juvenile is being charged with a felony, the officer will bring the reports to the District Attorney's Office for review and the Deputy District Attorney will decide what charges are appropriate. A letter is then sent to the juvenile and parents with notification of the court date. If the charge is a misdemeanor, the officer will write a juvenile a summons (ticket) signed by the juvenile and a parent or guardian and the court date will be on that document. Can law enforcement talk to my child without a parent present? Yes. However, if the juvenile is in custody, and the officer wants to ask them questions about their involvement in a crime, a parent must be present. What does Joint and Several Restitution mean? If there is more than one defendant charged with a crime, the Court can order all of the participants to pay the full amount of restitution. Once the full amount has been received by the Court, they will no longer accept payments. This ensures that if one defendant does not pay, the victim will still be fully reimbursed. How soon can I get my juvenile record expunged? Immediately. See the Sealing/Expungement Webpage. How do I become emancipated? There is no formal emancipation process in Colorado. To be emancipated, the juvenile must be at least 16 years of age and independent in matters of care, custody, and earnings, or be married or in the military. If this can be clearly shown, a juvenile may then be considered emancipated. Does my juvenile record go away when I turn 18? No. Anything on your record will remain there unless you are eligible for expungement, and go through the formal expungement process. See the Sealings/Expungements webpage. Can I get a copy of a police report on a juvenile case? A juvenile who is charged with a crime, or his parent or guardian, is entitled to all police reports pertaining to that case. Victims can have limited access subject to the discretion of the Deputy District Attorney. Police reports involving juveniles are not available to the general public. Recovery Court is an alternative to the regular docket in both adult and juvenile court. Offenders who have committed non-violent crimes relating to drug abuse and addiction problems are eligible for this program. Recovery Court utilizes the focused involvement of the Court, probation, treatment providers, and others involved in the criminal justice system to increase direct supervision of offenders, coordinate public resources, and expedite case processing. Through Recovery Court, offenders are given the tools and support to make positive changes in their lives and break the cycle of alcohol and drug use, criminal behavior, and incarceration. If I have received a citation/ticket for no proof of insurance and am unable to appear in Court, can I provide proof of insurance at another time or by mail and have my case dismissed? You may follow the attached instructions and complete the Affidavit of Insurance two weeks prior to your Court date.